The present numbering of Holywell Street has remained virtually unchanged since 1837, when the street was completely renumbered. Hence it has the old-fashioned style, which always runs 1-2-3-4-5 etc. along one side of the road, crosses over and continues down the other side, which means that the highest number is always opposite the lowest. When the present numbers were allocated, Holywell Street had 99 houses or shops plus the Music Room, and no college buildings. No. 1 Holywell Street is at the north-east corner of the street at the junction with St Cross Road. Numbering then proceeds in an anti-clockwise circle, reaching 40 at the King’s Arms, crossing over and coming back to No. 100 near Longwall. The larger, better houses were all on the north side of the street, with views at the back of the University Parks: hence there were only forty houses lining Holywell Street there, compared with sixty on the south side. The first directory in which Holywell Street is numbered as it is today is Robson’s Commercial Directory of 1839. The houses are unfortunately not numbered at all in the 1841 census but can be identified by matching the directory numbers can be matched with those of Hunt’s Directory of 1846 and the 1851 census. After that identification is easy, and the numbers remain the same until the last Kelly’s Directory of 1976. 1891: Two houses (Nos. 22 and 23) demolished to make way for Mansfield Road. In 1976 and 1981 the façades of Nos 45, 46, 47, 48, 49, and 50 were incorporated into Hertford College’s Holywell Quad. Many of the surviving former houses are now part of the four colleges which were once adjacent to the street and are now part of it (Wadham, Hertford, Harris Manchester and New College), while Merton College (which once owned the whole Manor of Holywell) uses many of the houses as student annexes. There are now appear to be only six buildings in Holywell Street that are not used by the University or its colleges: one is part of the Kings’ Arms pub, one is a hotel, one is a café, and three are shops (a photocopier’s, a newsagent’s, and a delicatessen). Holywell Parish helpfully numbered its houses before it became obligatory, starting with No. 1 where 1 Holywell Street is today and continuing west along the north side of the street as today and then returning on the south side. Some of the old numbers can be found in Jackson's Oxford Journal: for example, on 17 October 1807 there was an advertisement to view a live crocodile at “No. 32 Holywell Street, opposite the Music Room”, so it must have been near the south-west end. The big number change must have taken place in the autumn of 1837, as the address of Jonathan Lowndes, the printer of Jackson’s Oxford Journal (which was printed at 100 Holywell Street) is still given at the end of each edition as 60 Holywell Street up to 9 September 1837, but by 14 October 1837 it is recorded in each newspaper as 98 Holywell Street. As there are just two large houses in the street after Lowndes’s home, it suggests that before the late 1830s the numbers stopped at 62. As the layout of buildings had not then changed radically since the eighteenth century, the numbers must have been allocated differently from today, perhaps with groups of houses in one building being allocated just one number. It is possible that the numbers referred to Merton College leases, as a tenement on the south side of Holywell a few doors from the corner of Broad Street was known as the Twenty-seventh house in their lease books. The lintel of the present No. 3 Holywell Street has its pre-1837 number III (3) on the right of its lintel and repeated in the middle, and the number IV (4) on the left. 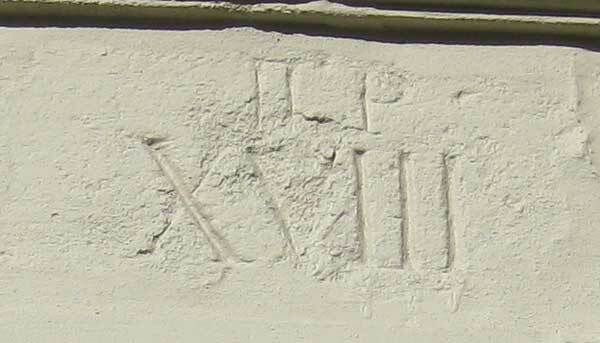 This perhaps indicates that the house was divided into two, with the bulk on the right numbered 3 and a smaller section on the left numbered 4. The present No. 26 Holywell Street has its pre-1837 number XVIII (18) engraved over its door. This is preceded by the letters H.P (Holywell Parish). The present No. 53 Holywell Street is engraved with its old number XXXII (33), and this squares with a newspaper report of 1807 which mentions that the house then described as No. 32 Holywell Street was opposite the Holywell Music Room.